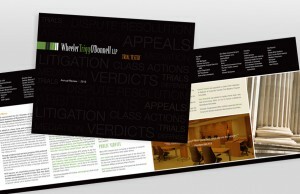 We just wrapped up the design and printing of law firm Wheeler Trigg O’Donnell’s Annual Review. The 12-page review summarizes WTO’s services and the results it achieved for clients in 2013. Also included is a report on the Wheeler Trigg O’Donnell Foundation, which donates both money and thousands of volunteer hours to various nonprofit organizations. WTO is ranked in the first-tier in Colorado law firms in 11 practice areas by U.S. News & World Report. WTO is also ranked nationally by U.S. News in the third-tier for environmental litigation, and labor and employment litigation. The review was designed by TCA graphic artist, Jennifer Armstrong.